The weathered face of a Peruvian queen buried with a vast trove of jewels and treasure 1,200 years ago has been reconstructed for the first time. Experts spent 220 hours hand-crafting the features of the wealthy Noblewoman, who was at least 60 years old when she died, using a 3D-printed cast of her skull and data on her bone and muscle structure. 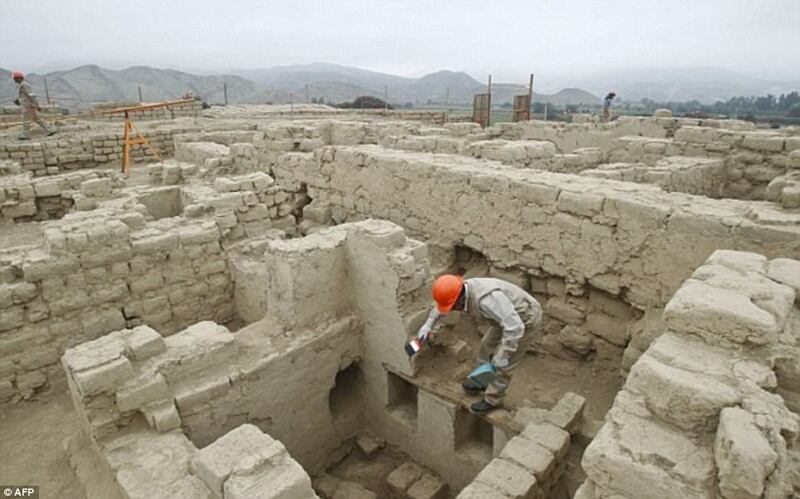 Archaeologists uncovered the tomb of the so-called Huarmey Queen alongside 57 female aristocrats from the Wari culture, an ancient people that ruled the region centuries before the famous Incas. 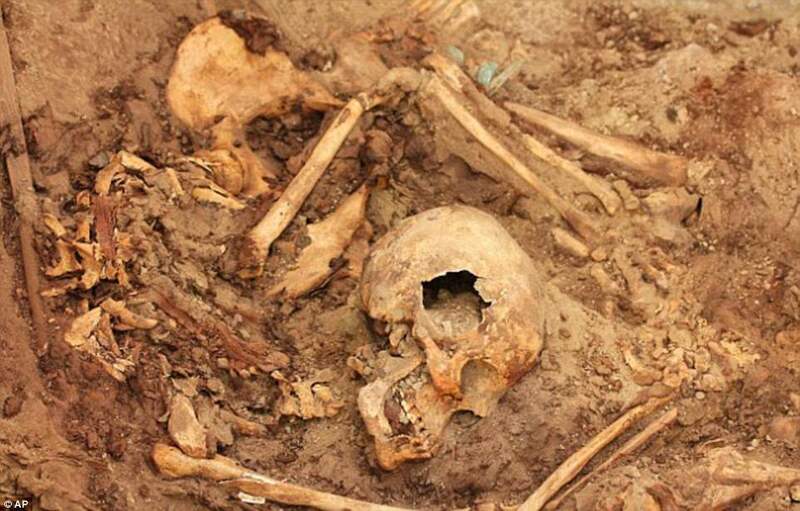 Scientists say the woman was buried in particular splendour, with her body kept in a private chamber surrounded by jewellery and other luxuries, including gold ear flares, a copper ceremonial axe, and a silver goblet. Now experts have recreated the woman's face to try and understand more about her life, who researchers suggest earned her lavish burial as a master craftswoman. 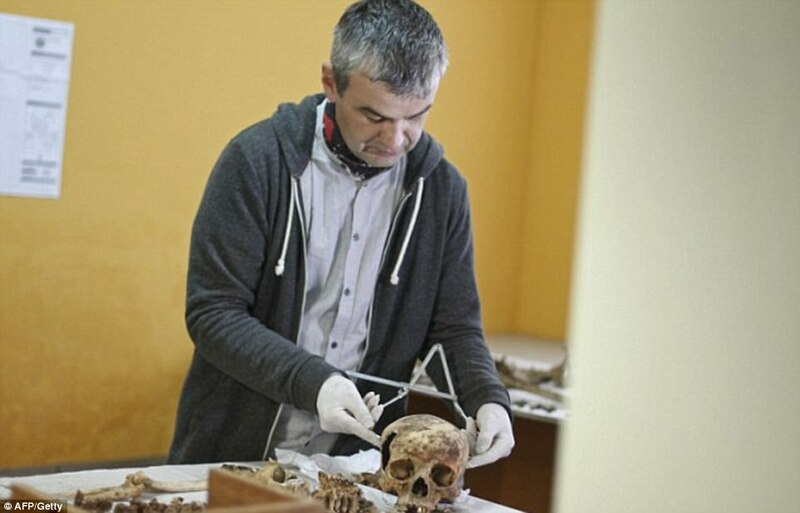 The burial chamber, miraculously untouched by grave robbers for centuries, was uncovered in 2012 by University of Warsaw researcher Dr Milosz Giersz and Peruvian archaeologist Dr Roberto Pimentel Nita. 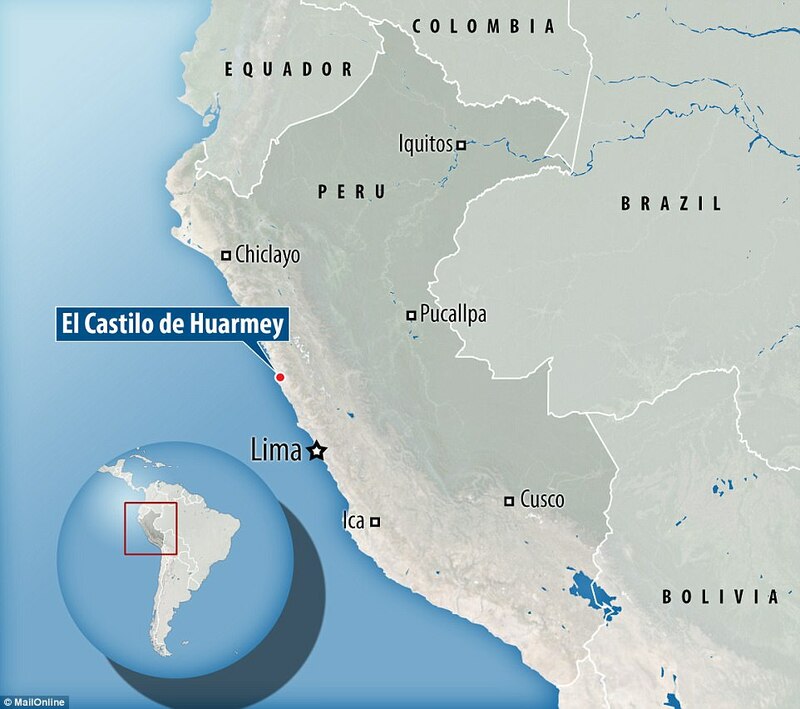 Experts labelled the 1,200-year-old 'Temple of the Dead', found at the El Castillo de Huarmey site, a four-hour drive north of the Peruvian capital Lima, 'one of the most important discoveries of the century'. 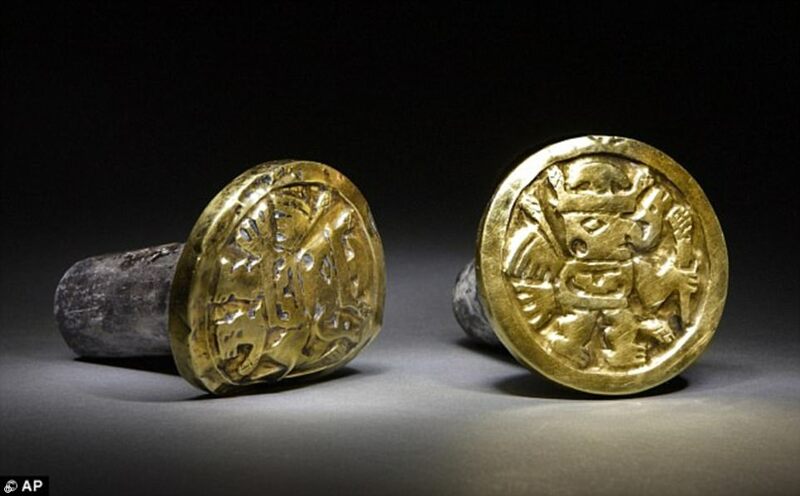 The Huarmey Queen was buried with weaving tools made of gold, suggesting she earned her elite status as an expert craftswoman, National Geographic reports. An analysis of her skeleton showed she was at least 60 years old when she died, and used her upper body extensively while spending most of her time sitting, lending credit to the 'master weaver' theory. Andean cultures from the time, especially the Wari, prized their weavers and the intricate textiles they produced, which sometimes took two to three generations to craft. Dr Giersz said that the textiles the women made over her lifetime would have far out-valued the gold and other treasure she was buried with. 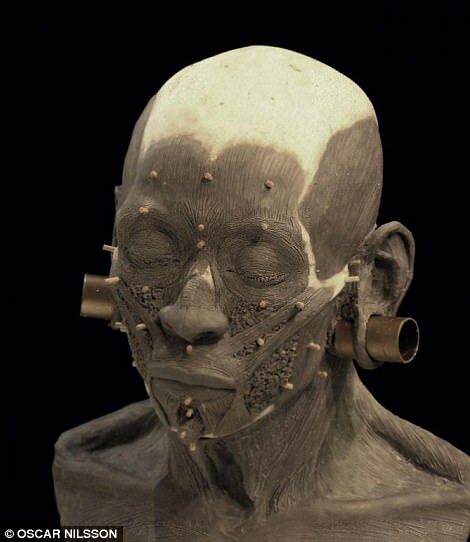 To find out more about the Huarmey Queen's life, the researchers commissioned facial reconstruction expert and archaeologist Oscar Nilsson to rebuild her head. Mr Nilsson, who is based in Stockholm, Sweden, used a 3D-printed version of the Noblewoman's skull as a base, but recreated her features by hand. 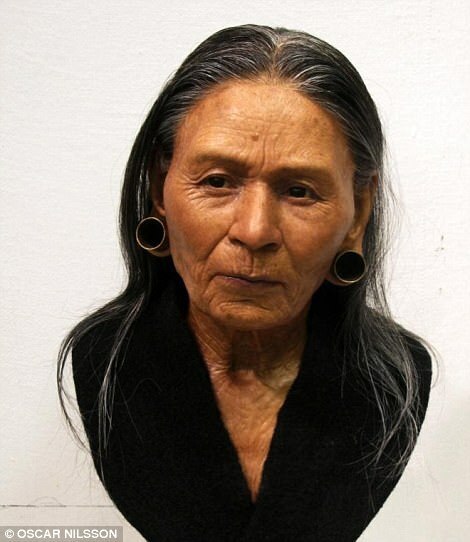 A facial reconstruction expert used a 3D-printed version of the Noblewoman's skull as a base, but recreated her features by hand. Her new face was crafted using datasets that allowed the archaeologist to estimate the thickness of her muscle and flesh. 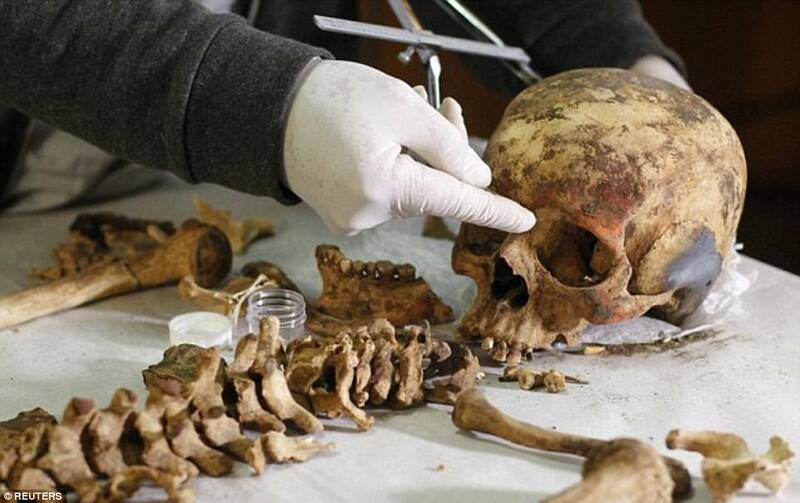 Chemical analyses of the Huarmey Queen's bones have shown she grew up drinking local water, allowing him to base his model on pictures of contemporary inhabitants in the El Castillo de Huarmey area where she had lived. 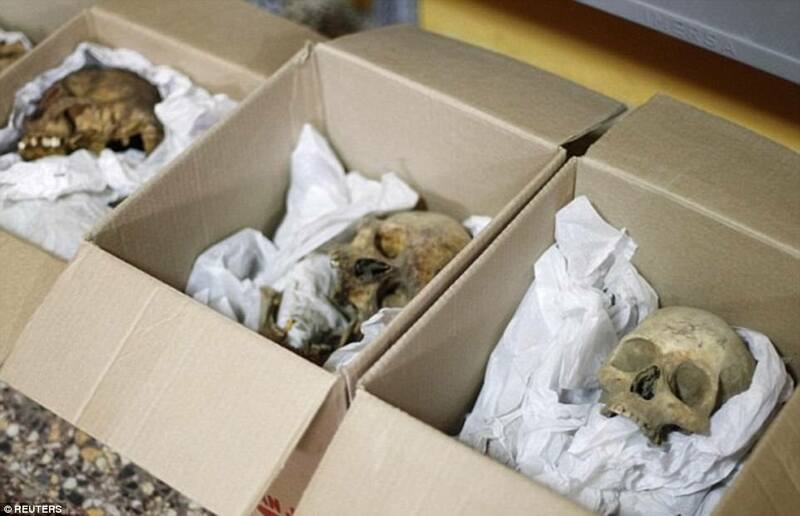 To reconstruct her hair, some of which remained on her skull when she was found thanks to the arid climate, the expert used real hair from elderly Andean women from a Peruvian wig-supply market. Her new face was crafted using datasets that allowed Mr Nilsson to estimate the thickness of her muscle and flesh. 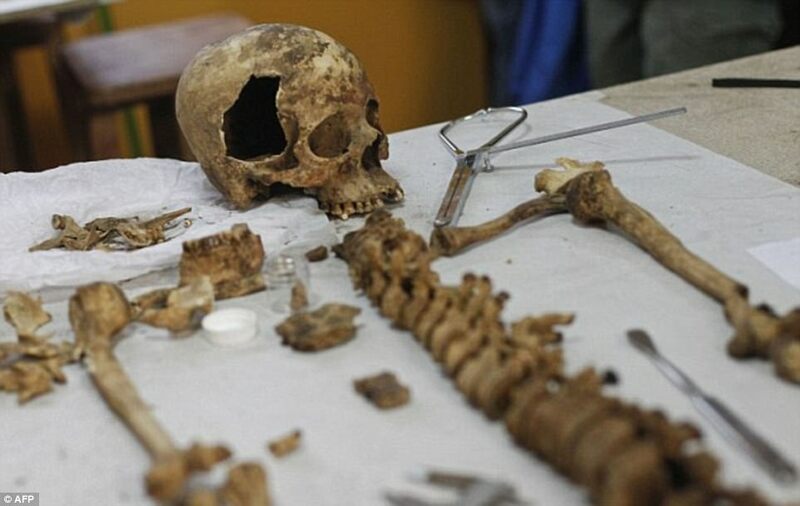 Chemical analyses of the Huarmey Queen's bones have shown she grew up drinking local water, allowing Nilsson to base his model on pictures of contemporary inhabitants in the El Castillo de Huarmey area where she had lived. To reconstruct her hair, some of which was still attached to her skull when she was found thanks to the arid climate, Mr Nilsson used real hair from elderly Andean women from a Peruvian wig-supply market. 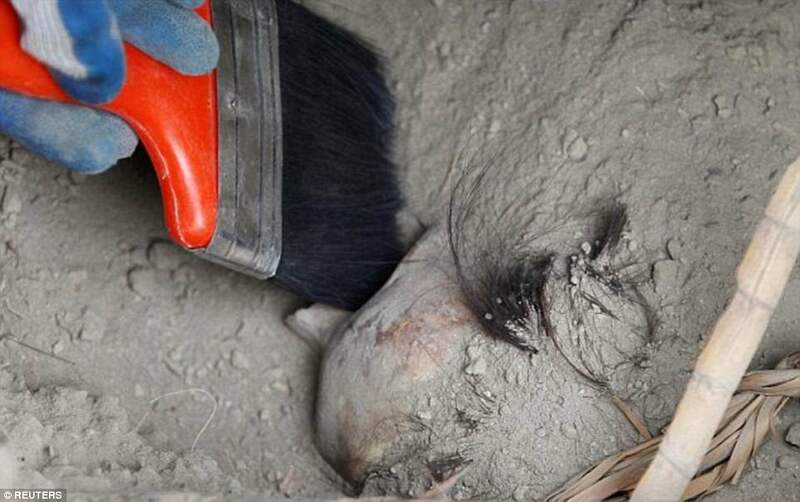 'When I first saw the reconstruction, I saw some of my indigenous friends from Huarmey in this face. Her genes are still in the place,' Dr Giersz said. WHO WAS THE HUARMEY QUEEN? Scientists say the Huarmey Queen was buried in particular splendour, with her body kept in a private chamber surrounded by jewellery and other luxuries, including gold ear flares, a copper ceremonial axe, and a silver goblet. The Huarmey Queen was buried with weaving tools made of gold, suggesting she earned her elite status as an expert craftswoman. The Wari culture were a civilisation that flourished in the south-central Andes and coastal regions of modern-day Peru from around AD 500 to 1000. The Wari people were one of the earliest civilisations to construct road systems to connect a series of urban centres, with some groups even creating canals for irrigation and transport. 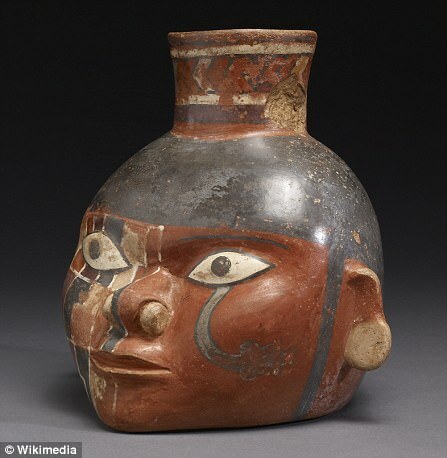 Their expert agricultural practices helped them resist a 30-year drought period during the end of the 6th century AD that contributed to the decline of the neighbouring Nazca and Moche civilisations. Experts suggest that many of the Wari's practices later influenced the more famous Inca civilisation, which took control of the region from around 1400. 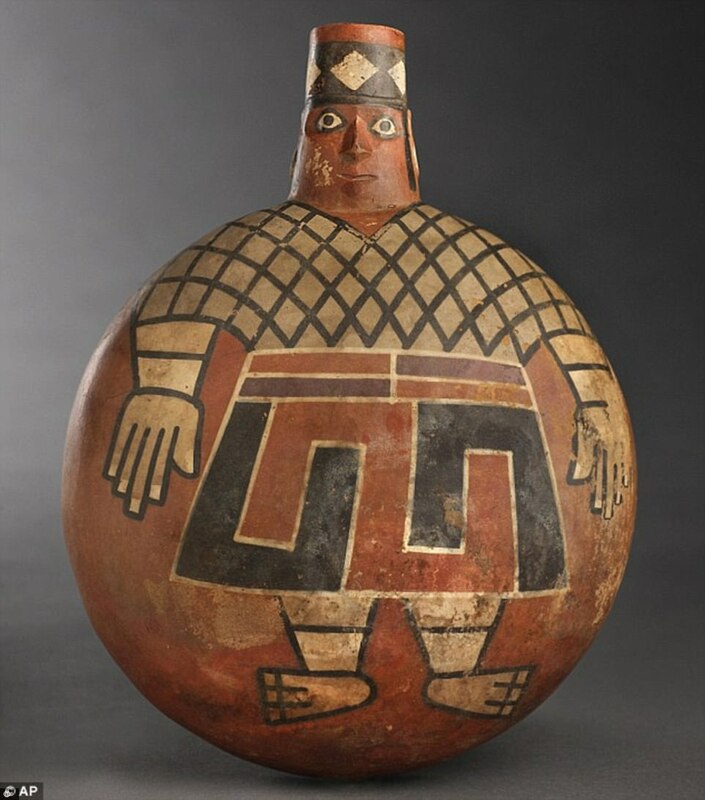 The Wari were known for their elaborate pottery and textile practices, which often depicted religious figures.